You were there at the beginning!" "a monster saxophonist / composer"
Last month, Malcolm Lynn Baker, professor and director of Jazz Studies and Commercial Music at the University of Denver, released a new book on jazz theory and pedagogy called, The Shape Method for Jazz Improvisation. The Shape Method "is a unique approach to learning how to improvise jazz. The method will help you unlock the secrets of great jazz phrasing and guide you to developing your own language within the jazz tradition," Baker states. While there are many books on jazz theory and pedagogy, many of which are currently used in colleges and universities already, Baker's book aims to get students improvising and composing jazz tunes like pros more quickly and convincingly than the programs in which these books appear. It doesn't have to take years and years to become a good jazz player. In fact, students could begin improvising great solos and composing their own work in a matter of months, maybe even weeks. Further, the book is good for DIY's or students who are practicing and learning outside of an academic institution. No professor necessary. The book's publication is an important one. It serves as an example of an inter-mingling of the publishing and social media worlds. Baker's book utilizes social media platforms such as Facebook and YouTube as part of the process for learning and getting the word out. The book proves to be more than just a text for university classes, and is marketed as such. The book and its accompanying resources include old teaching paradigms and brand new ones while harnessing the powers of a more natural and intuitive learning method. It also connects local musicians and organizations in a bit of a grassroots effort that has brought in hundreds of page-views already to the YouTube introductory sessions for the book, which launched August 4. The book also serves as an example "of how teachers continue to hone their skills and re-examine their teaching in order to do a better job," said Baker. Before he had begun developing and using this method, he had noticed that his students were struggling even though they were adamantly listening to and studying jazz in depth. They just weren't making the mark, and listening to the results of their work was quite frustrating. "I have noticed that the various [jazz teaching] methods employed were not as successful as I thought they should be," he relates in his book. "Jazz is an aural language, and it is widely acknowledged that listening to it is crucial to being able to play it. However, I have had many experiences with students who I know are listening a lot but still are not able to play in a convincing jazz style." The way music was (and still is) taught in the academic setting didn't seem to be intuitive. It may have even seemed a little backward. Certain nuances were not explained in jazz pedagogy. It was all about technique and learning the data from a book. As a result, student improvisations and compositions regularly felt awkward and canned. Music doesn't happen the way we teach it in school. The chord/scale relationship [we teach] has taken over music pedagogy. [Because of this, I wanted to] see if there's some way I can take a great solo, if there's a way I can describe a solo without even consulting chord/scale relationships. I want to completely describe what's going on in that solo. Baker is not solely speaking of what notes are played and for whatever duration; he is also speaking of actual patterns that are reoccurring throughout the jazz traditions. By attempting to distill decades of listening into a group of "common, foundational characteristics" that make great jazz improvisations "great", he found an "appropriate hierarchy" of five characteristics. These characteristics explain what was happening on any given note on any given great jazz improvisation, recorded or documented, that he had researched. Baker's new pedagogy is successful, with proof to the methods' effectiveness. He has seen the results in his students' work, and the book is beginning to get attention from some of the major players in jazz. Hal Galper, a famous jazz pianist and educator, told Baker, "I think you've added a much needed contribution to a subject rarely discussed." Want to know more about the new Shape Method for Jazz Improvisation? On Aug. 4, Baker began releasing introductory lessons to his course which can be followed on his YouTube Channel for the book. The introductory chapters will be released through the first week of January. Each chapter is an introduction to each of the concepts from the book where there are more detailed analyses, practice exercises, and resources for furthering jazz improvisation studies. The book is available at Amazon in paperback and Kindle formats. From the opening bass lines of "Color Line" on Azure Intention, it is evident that saxophonist Lynn Baker's Quartet comes out swinging and grooving. But there is also a captivating sense of sophistication, thoughtfully played into the selections. Baker—who doubles deftly on both soprano and tenor saxophones—composed all of Azure Intention's eight tracks, each performed with enough time and space as to allow the musicians to contribute without seeming rushed. The quartet has been gigging around Denver enough that they are a cohesive unit; hence, they have mastered that elusive ability to change tempos, where the quality and quantity of their playing time is revealed. 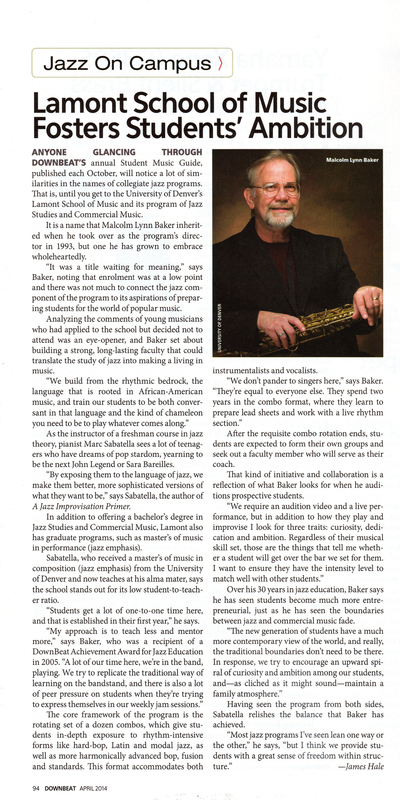 Like Baker, who has top credentials as a teacher, pianist Reggie Berg has a formal scholastic background, as well as intensive classical training; the same can also be said of drummer Paul Mullikin. Bassist Bijoux Barbosa hails from Brazil, and his innate sense of rhythm and tempo are evident throughout. Everyone in the quartet complements each other extremely well, and the music flows along with auditory ease. "Into the Blues" is a study in complex syncopation that then bursts into a joyous swing, which seems to define the quartet as well. "Happy New Year" possesses a festive Caribbean groove, where all are welcome to sway in the breeze. "Appalachian Shuffle" kicks into a soulful groove, which Baker carries well on tenor, giving it an authentic R&B sound, as does Berg on piano. Azure Intentions, is a thinking person's album, where high expectations are not disappointed; connect with the message, the content will be appeased. Thank you for creating this wonderful music and it's truly my pleasure to be able to share your works with the listeners. Azure Intention, the Lynn Baker Quartet. Denver-based saxophonist Baker is the Director of Jazz studies at the University of Denver, and on this, his debut recording for OA2 records, he shows a sophistication and lovely tone. There is introspection on the opening tracks, "Color Line" and "Lament," which are both beautiful and melancholy. Baker's improvising is fluid and not flashy, even when the tunes get quick, as on "Into the Blues." He lets the chords move him through the pieces, giving way to the brilliance of Reggie Berg on piano for the faster stuff. The same smoothness arches over the disc and all the original compositions. There is an easiness throughout, which makes for a very listenable disc. It's not challenging, but it doesn't have to be. 2010, OA2 Records, 56:50. Saxophonist Lynn Baker has been the Director of the Jazz Studies program at the University of Denver's Lamont School of Music since 1993. Two of the members of his quartet: pianist Reggie Berg and drummer Paul Mullikin are graduates of the program, while Brazilian-born bassist Bijoux Barbosa is well-regarded player on the Denver scene. Meanwhile, the compositions on Baker's excellent release Azure Intention were written by the artist over a twenty year period. These factors contribute to a record that is shimmering and sophisticated, with space given to all of the players to fill in their own shading. "Color Line" starts things off in a thoughtful mood (it references the ethnic violence that occurred in Denver in 1993) with Baker's smoky soprano over a moody rhythm section that perfectly captures the sadness without becoming maudlin. Berg is a well-chosen complementary performer on the piano - and his solo here is a model of graceful inventiveness, while Barbosa adds a bass solo that maintains both mood and groove on this highly satisfying number. The lovely and bittersweet "Lament" follows with Baker switching to tenor and Millikin showing considerable sensitivity in his support. Again the song itself and the atmsophere created are what counts here, as opposed to showing off "chops." The assured flow of this song is such a pleasant diversion from the usual frenetic pace and "look at me" attitude that afflict much modern music and musicians. And again Berg's solo is as natural as a flowing stream. The calm is stirred with the rhythmic "Into the Blues" on which Baker hints at some of the avant garde sounds he has explored with his free-form improvisational trio Ryhthmic Void. But the song also offers a lengthy middle section of pulsing rhythm drone over which Berg layers free form piano trills and it also surprisingly shifts into straight ahead swing. "Happy New Year" is perhaps the pop tune of the album, with a Carribean rhythm and light and joyous melody. The rest of the album follows suit with enjoyable and mature songs, with the waltzing "Davids Tune," peaceful title track, strutting "Appalachian Shuffle" and constantly-shifting "Spinning" rounding out this remarkable recording into which an obvious amount of care has been taken to gift their listeners with music of depth and color too rare in these days. Lynn Baker was both a jazz musician and educator for a long time prior to this CD, evidently his belated recording debut as a leader. Accompanied by two graduates of the Jazz Studies program at the University of Denver (pianist Reggie Berg and drummer Paul Mulikin), which he directs, plus Brazilian bassist Bijoux Barbosa, Baker showcases eight compositions written at various points in his career. "Color Line" is a hip opener with dark undertones and a Latin undercurrent, showcasing strong solos all around, including the leader's thoughtful soprano sax. The joyous "Happy New Year" has an engaging Afro-Cuban rhythm with a simple yet infectious theme in a brisk setting, though it is quickly transformed into driving bop, with the leader making a belated entrance on soprano. The brooding "Azure Intention" evolved from Baker's reversing the chord changes to the popular standard "On Green Dolphin Street," creating a haunting song that leaves a lasting impression. Baker's robust tenor sax is showcased in his angular "Spinning" and the tense "Appalachian Shuffle." Lynn Baker deserves to head into the studio on a regular basis on the strengths of Azure Intention. Saxophonist Lynn Baker has been a fixture in the Denver jazz scene for nearly 20 years, so don't beat yourself up if the name doesn't ring a bell. The work he's put in over that time has culminated in this largely solid recording of eight original tunes. Whether on tenor or soprano, Baker's tone is light with just a hint of vibrato. He glides effortlessly through melodies, best exemplified on the ballad "Lament," one of the disc's strongest pieces. Even on a harder-driving piece such as "Into the Blues," Baker's attack is always well balanced and clearly articulated. Baker's bandmates are in full sympathy with his approach, particularly pianist Reggie Berg, whose light touch and lush chords float along with Baker's fluid lines. Given Baker's style, it's the more contemplative pieces, such as "David's Tune" and the title track, that best allow him to dig into a tune and express himself fully. But not everything here works. The calypso-inspired "Happy New Year" comes off rather stiff - more like forced fun than a burst of joy. And the multifaceted "Spinning," though interesting in parts, seems more like an academic exercise in counterpoint and shifting meters. Even some of the better pices have a somewhat clinical feel about them, possibly becuase these tracks went through such a lengthy gestation period before Baker committed them to record. But Baker has an engaging style, and it will be interesting to hear him tackle less familiar material in the future. Lynn Baker is another musician with a primary job as a teacher, and is a player in a secondary capacity. When jazz was at its peak, schools didn't teach this art form; openings as sidemen were so abundant that talented, mostly self-taught, artists had all the work they desired. Then, just as a demand arose for high school- and college-age courses in jazz, public interest began to wane. As a result, many of today's jazz musicians must augment their income by teaching, in order to be able to make a living composing and playing the music they love. This album contains selections composed and arranged by Baker during the past 20 years. Since 1993, he has been director of the University of Denver's Lamont School of Music. Three members of this quartet were students there: Pianist Reggie Berg and drummer Paul Mullikin join Baker, who performs on soprano/tenor saxes and congas. Brazilian bassist Buoux Barbosa moved to Denver in 1996, where he remains much in demand. This is a thinking listener's jazz; every track has a motive or theme behind it. The music is relatively complex, without being stuffy, performed with variations in meter, key and style. For example, "Into the Blues" begins in 5/2 time, then transitions into a driving 4/4 straight-ahead groove. The resulting tracks will never bore you. 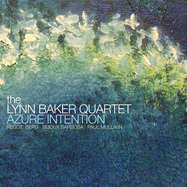 Lynn Baker Quartet's Album "Azure Intention"
Malcolm Lynn (Lynn) Baker has influenced many musicians you listen to in Denver but you probably do not even know it. The current head of the University of Denver's Lamont School of Music's Jazz Program and former director of admissions for Lamont as a whole is something of a modern day renaissance man. I performed under his direction for four years in Lamont's Jazz Orchestra and count myself the better for Lynn's tutelage (alternatively-count better by myself). Lynn recently (September 2010) released Azure Intention, an eight song disc from his quartet out on OA/2 Records and available here for purchase as an autographed copy for your holiday gifting. I rate Azure Intention 5 stars out of 5. Lynn wrote the tracks over a period of decades. His incredibly tuned-in and developed ear has led to the release of a technically flawless album that still oozes and pulses with life and humanity. Lynn had the opportunity to shape two of this quartet's members during their study of Jazz at DU. This disc has a variety of tableau's, including funk that moves your behind on an electric switch and boppin' jazz in both recognizable and fantastic new orientations. Azure Intention is superbly crafted by each of it's fine musicians. Lynn brought lots of talent to the studio with him. Pianist Reggie Berg, bassist Bijoux Barbosa, and drummer Paul Mullikin all entertain and enliven in both accompanying and soloing roles. Bijoux is of Brazillian extraction, and like all the players in this quartet keeps himself busy playing all around town. Reggie and Paul are the . Lynn Baker Quartet's album Azure Intention is a must-have addition to every Denver jazz-head's collection. Lynn is a politically conscious individual. He once told me he writes his congressional representatives at least once a day. Political intent on Azure Intention is up to you to connect to via the liner notes; the disc is entirely instrumental jazz. Furthermore, I do not think Lynn is trying to convey specific solutions to problems via Azure Intention, but he and the rest of the quartet do a great job of conveying mood's and feelings listener's will connect with throughout Azure Intention. The liner is worth delving into for some specifics, one example is opening track 'Color Line.' This track is about extreme ethnic violence in Denver that occurred in 1993, the year Lynn became director of Jazz at DU. The song does a little mourning but a lot more questioning-a feature people who know Lynn will recognize. All of the 8 tracks on this album are professionally performed by this madly talented quartet. For my reaction to each song, visit my blog entry here. 'Into The Blues' takes you into Lynn's brain for his experience of the blues. You or your giftee should know the album does have one holiday-related tune, 'Happy Happy New Year'. This track could get even cranky and callow Ebenezer to spontaneously add in his own lyrics about a pleasant and happy 2012. On the title track, the quartet create a feeling of floating without ever taking their own feet off the ground. The album's final track, 'Spinning,' spins you up and leaves you wishing for more. Azure Intention is great for a solitary hour to recover from the holidays or to share with friends. "The consummate skill set he brings to the table is beyond impressive. He is an accomplished saxophonist and doubler equally at home in Bebop, Classical and those organic improvisational contexts which demand not only a superior technical mastery of the instrument but a total trust of the intuitive and ability to deliver a sonic integrity emanating from the WHOLE MUSICIAN, not a rehashing of vocabulary which has long been codified beyond the point where anything fresh and new can be said." "Lynn Baker plays saxophone in a way that exceeds any narrow definition of 'Jazz.' Yes, he gives genuine respect to all the eras of the art, playing the Bebop part for example. But because he's a modern thinker, he will also jump out into the edge to push and pull you in with yet an individual approach and sound that's riveting!" "...a warm, understated tenor solo...strong blowing on tenor...the soprano saxophone catches fire on the classic Here's That Rainy Day." "Lynn Baker is a musician endowed with those qualities that elevate him above the norm. He is a fine player with the background and knowledge that allow him to clearly express his music directly to his audience." 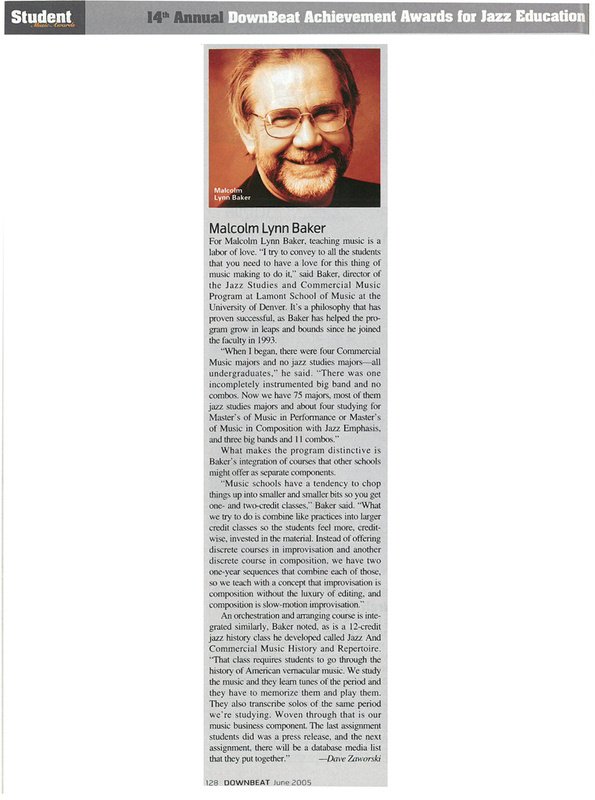 "Malcolm Lynn Baker is perhaps the finest saxophonist that I know. His command of both the instrument and the music is rare in any genre, and he brings an intensity to his playing that is singularly compelling. Everyone who hears him play can tell that they are hearing a master musician at work. That I should feel this way is, perhaps, not a surprise. We have been friends and collaborators for some 20 years, and I have been honored by his performances of my music. But I will also say that I know of no one who does not have the highest respect for Lynn Baker and his musicianship. Those of us who have made music with him have always been lifted by his energy and musical abilities. As a composer I can find no higher compliment to pay Baker than to say that whenever I compose music for the saxophone, it is his saxophone that I am hearing." "Lamont faculty member Malcolm Lynn Baker's work, Giving, was performed next. This terrific piece began in the orchestra, but it soon became apparent that this was a short introduction which led to an almost John Cage-like percussion ensemble, which reminded me very much of Imaginary Landscapes One and Two, by Mr. Cage. This was a deceptive piece simply because I fell into the trap of imagining that the work with the title of Giving would be a little more gentle, but this was a hard driving and very impassioned piece of music. After this section, and it seemed to be inABA form with the percussion solos in section B, the orchestra in the A return was clearly microtonal. But its emotional fluency was so great that I wondered if this wonderful piece was some kind of avant-garde tone poem. I would really like to see the score to this composition." "Lynn Baker is a master musician whose contributions to the world of contemporary jazz, as performer, composer and educator, will have a lasting impact. His work is distinguished by virtuosity and originality, and by a creative versatility that allows him the privilege of handling with command many musical languages and styles." 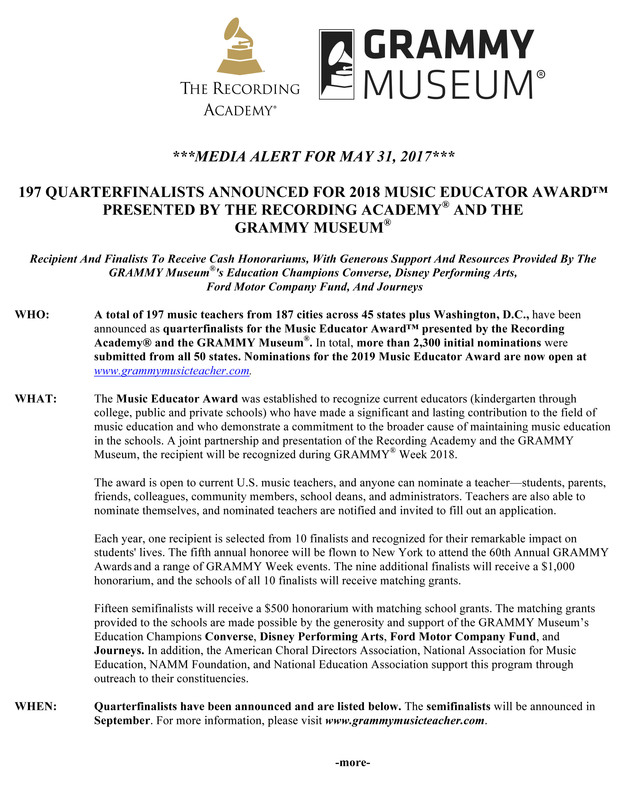 I'm a Quarterfinalist for the Recording Academy/Grammy Museum 2018 Music Educator Award. I'm honored and humbled. "Lynn was a person of great intellectual curiosity, willing to take risks and operate at the liminal conditions of music, not the comfortable, known center. The first day of his "sound exploratory ensemble" was spent listening to "silence" in various facilities--just the kind of thing to make an impressionable sophomore's head spin. Lynn was among a handful of teachers who dared to throw out all of the paradigms, manufacture a relevant ancestry, and start over." "...an obvious enthusiasm for the music and desire to pass it on to those younger musicians who also share the love of this music make him an excellent teacher and educator in addition to being an excellent performer." "'I wouldn't be the twisted person I am today without the insidious influence of Malcolm Lynn Baker during my undergraduate years...' Maybe the wrong track. 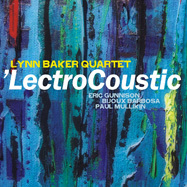 How about something like: 'Malcolm Lynn Baker helped open my mind to worlds of new possibilities and different ways of hearing music during the time I studied jazz and improvisation with him at Carleton College.' "
"I have known Lynn Baker for fifteen years and have to say that he is about as close to the whole package as anyone will find in the Jazz industry- performing, composing, arranging, educating, innovative, perspicacious administrating, curricular design that maximizes all the new technology can offer, and the uncanny ability to break down the false stylistic barriers in music education that others of less ecumenical capacity cloak as stylistic expertise by default. Lynn is brilliant, and effortlessly so. He takes himself far less seriously than those with a tenth of his talent or that the great fruits of his labors would warrant- for he is about crafting the future and not basking in the complacency of present accomplishments. For all who have had the fortune to work with him, he is a total joy to be with. Regardless of the setting, for Baker, music and its pure enjoyment come first. His infectious positive energy inspires his students to rise to their highest potential without the traditional teacher-student dialectic impeding either the development of vital expression or the transmission of core artistic values. For anyone interested in experiencing a most special musician, artist and educator, I suggest you click on his URL right now and open your date books wide."